After a very long two months of Summer Reading and Celebrity Storytime, I am back in the storytime rocking chair with some new Pre-K themes! (Or, rather, some new themes and some old themes revisited.) This week, I did one of my favorite themes: Bugs! 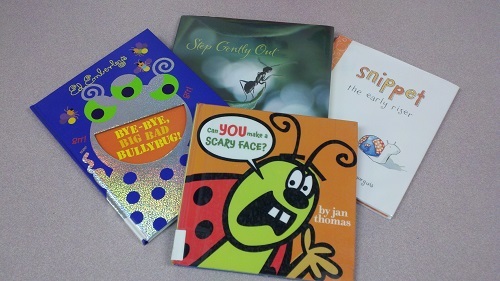 Now, I’m not a huge fan of bugs in real life (with the exception of ladybugs and lightning bugs…and crickets), but this storytime theme has so many awesome books and activities to choose from that the hardest part of planning a bugs theme is deciding what to exclude! To give you an idea of how many great bug books and activities are out there, here’s what I did in 2011 for a pre-k storytime, and here’s a bug theme that I did last Spring with the toddlers. Snippet is a snail who tends to wake up earlier than his family members. Snippet’s ready to play, but his family snores on. With the help of some bugs, Snippet discovers the best way to rouse his sleeping family. The pale yellows and greens in the illustrations invoke a sense of early morning, and the bugs and snails are charming. In this picture book, three baby lightning bugs meet a big, bad bullybug who has three green eyes, sharp white teeth, and…well, you know the story. For this book, I tried a new activity from Julie Dietzel-Glair’s Books in Motion. Prior to reading the story, I handed out blank sheets of white paper and one crayon per child. I then encouraged the children to draw the big bad bullybug as we were reading the story. As I read the story, I drew my own bug on a sheet of paper so that the children would have some guidance. We started with three eyes, then sharp teeth, and continued on until we had our big, bad bullybugs! At the end of the story, we put our sheets of paper on the ground and then stepped on the bullybugs! A ladybug narrates this story and tells children to pretend that they have a little, tickly bug on their noses. Hilarity ensues as children are instructed through a variety of movements that culminate with the chicken dance! This is one of my favorite Jan Thomas books, because it’s always such a huge hit with the preschool crowd! After so many raucous books during storytime, it was great to end with this calming book that explores a variety of insects. The close up photos of the bugs are absolutely gorgeous (and this is coming from someone who’s not a big fan of bugs)! The little one stops to stare at the sun. How It Went: This was a very interactive storytime, but it wasn’t chaotic. The children really seemed to like the fact that I allowed them to draw while I was reading a story, and the 4 and 5 year olds were able to follow the instructions and draw excellent Big Bad Bullybugs! The younger children just doodled, which I told them was perfectly fine. And they all loved stomping on their papers at the end. Can You Make a Scary Face was, by far, the favorite story, though the children also seemed to enjoy Snippet the Early Riser and Step Gently Out.